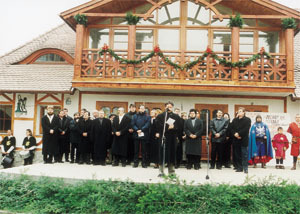 The Palatinus Civic Association recovering and protecting our town was found in 1999 by those inhabitants of Komárno whose common interest is to preserve and protect the cultural heritage of Komárno. With their activity they would like to contribute to the illumination of our town by the light of spirit. Since the year 2000 we pay the increased attention to the construction of the Europe Place in the centre of the town, as it offers the particular opportunity to create the new works of art and to restore the old ones. Their realisation and placing on the Europe Place will depend in a large extent from the provided support. 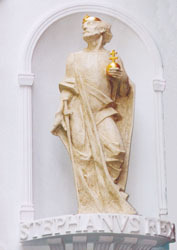 Thanks to the activity of the civic association the statues of the first Christian Hungarian king, St. Stephen and his wife's, Giselle Bavarian - made by sculptor Ondrej Csütörtöki - were unveiled on 17th December 2000. The employees of the SATES company from Považská Bystrica, which did the paving of the Europe Place, helped us to put the statues to the niches. It was a pleasure to watch how the Slovaks and Hungarians raised the statues to their places with united power. This event started at two o'clock p.m. by greeting the visitors by Miklós Fehér, the chairman of the Association on its behalf, followed by the speech of Zoltán Rockenbauer, the minister of the Ministry for National Cultural Heritage of Hungary and Gabriella Jarábik, the director of the Department of the National Minorities of the Ministry of Culture of the Slovak Republic. These were followed by the Zoltán Szénássy´s lecture on history. The mixed chorus Concordia took part in the programme. The statues were unveiled by Zoltán Rockenbauer and Gabriella Jarábik. After the ceremony minister Zoltán Rockenbauer handed over a memorial plaque minted in memory of the establishment of Hungary to the sculptor O. Csütörtöki, as well as to the writer of these lines, to Nándor Litomericzky. 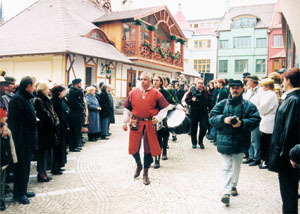 Those interested could take part in the cultural program of actor László Gálffi and the performance of the Ensemble „Honvéd“ in the town's Cultural Centre. The ceremony was finished by the dinner organized on the occasion of the unveiling of the statues. The creation of the statues was sponsored by: The Ministry of National Cultural Heritage of Hungary, the Foundation Illyés, the local self-government of Komárno, Gabčíkovo, Balatonfüred (Hungary), Csongrád (Hungary), Nagymaros (Hungary) and Budaőrs (Hungary), the municipalities of Žíp, Dulovo, Dvorníky-Včeláre; Ferenc Ferdinánd Olgyay, János Hegedűs, László Csukás, TNT servis - Sándor Németh, Nuki s.r.o., ELCONT - Ferenc Cseh, KY stavebná spoločnosť, DECART s.r.o., SATES s.r.o., MATACO - László Marosi, TATRASPOL - László Juhász, PAM s.r.o. Bratislava, László Szabolcs - Svätý Peter, AZ PRINT - Nové Zámky, BAUMAL - István Daniš, Baumer s.r.o., Trigons s.r.o., EURO INVESTA a.s., Bratislava. 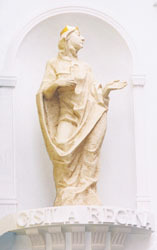 In 2001 we are planning to unveil the other two statues - in memory of the kings, St. Ladislas and Belo IV. The realisation of statues was sponsored by: The Ministry of National Cultural Heritage of Hungary, the Foundation Illyés, the Foundation for Building the Country, the Pro Slovakia Public Cultural Foundation, the First Communal Bank, the local self-governments of Komárno, Budaőrs (Hungary), Óbuda - Békásmegyer (Hungary), Budapest - Kőbánya (Hungary), the municipalities of Kocsér, Medgyesháza, Ferenc Ferdinánd Olgyay, Gipsol - Tibor Osztatni, Private Dentist Clinic Komárno - István and Mária Gyurász, MEMO SERVIS, CarnaudMetalbox Slovakia, EUROGRAM, C. N., EURO INVESTA a.s. Bratislava. The statues are under the professional supervision of the director of department Gábor Prokai and the Lectorate of the Graphic Arts and Crafts in Budapest composed of: sculptor György Benedek, the historian of art Géza Boros and sculptor Lajos Győrfi. 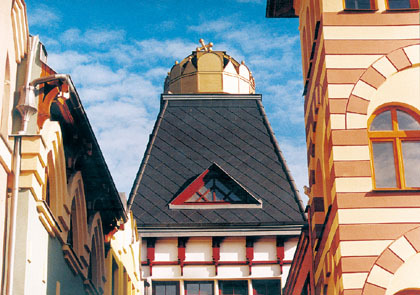 The point of interest of the Place is also the original shape of the richly decorated bell - tower made and given to the Palatinus Civic Association by xylographist János Bruncz from Komárno and which was thanks to the Komárno's inhabitants Frigyes Bott and László Stubendek situated in the Europe Place. This was due both to a happy accident and luck. The creator wanted to have it placed in one of the Komárno squares. When this plan was not realized, the next thought was to put it into the courtyard of the former Officers´ Pavilion in Komárno. However, the destiny wanted to get this excellent product onto its present position. The particular attention deserves the plinth of the bell-tower made of broken stairs, plinths and gravestones from Süttő and Tardos (Hungary). Let the bell ring also for that souls whose gravestone fractions got here. On 28th July 2001 at seven o'clock p.m. we passed the bell - tower to the public. One hour later the chamber concert of classic music took place in the Place within the framework of the Summer Festival as a worthy final chord of our ceremony. 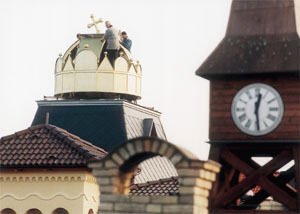 The lodging of the bell-tower was sponsored by : Frigyes Bott, the local organisation of Csemadok, the Palatinus Civic Association, Ferenc Bastrnák jr., Attila Czíria, Róbert Gyepes, Tamás Lohner, Béla Molnár, Zoltán Hodúr, Viktor Olláry, Béla Jakab, Tibor Varga, József Burián, György Szabó, Sándor Makó. We received and we are still receiving a big assistance from the local self-governments of the towns and communities, from the foundations registered either in Slovakia or Hungary, from the entrepreneurs and from several private persons willing to make sacrifices. We would like to use also this opportunity to express our thanks.